The crowd was surprised when Sef Scott stepped up to the podium during his high school graduation ceremony last week. Because the teen has autism and social communication disorder, he rarely speaks. So when he then proceeded to give a powerful speech about “doing the unexpected,” the students and spectators were in awe. Sef says that he was inspired to give the speech by his brother, who is a brain tumor survivor and public speaker for charities. For weeks, Sef worked with family members to perfect every sentence of the commencement address so he could surprise his peers. It all paid off, too. 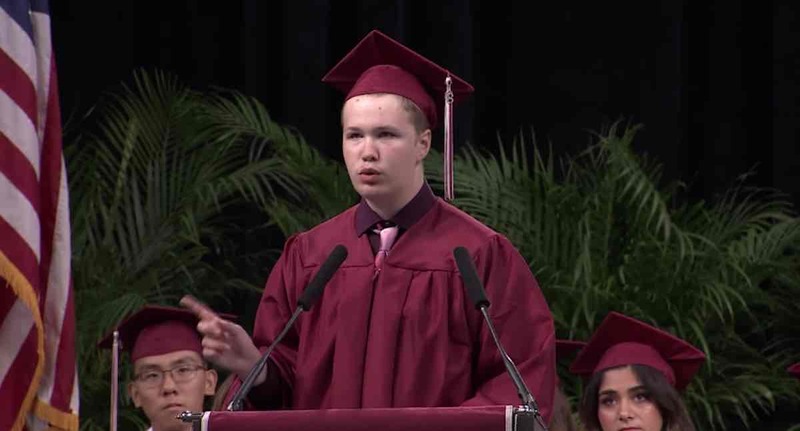 In the speech, Sef encourages his fellow grads of Plano Senior High School to follow his example and do the unexpected – whether it’s by doing little things, like giving a gift to a stranger, or by doing bigger things, like changing the entire course of your life. By the end of the speech, the Frisco, Texas football stadium spectators – several of whom were in tears – jumped to their feet so they could give a standing ovation.